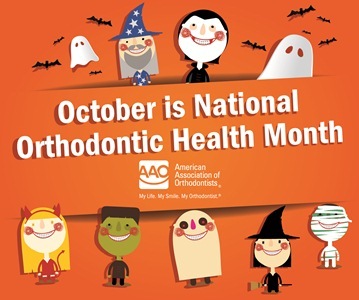 While everyone knows that October is when we celebrate Halloween, not everyone knows that October is also National Orthodontic Health Month in the United States. This annual observance is sponsored by our friends at the National Association of Orthodontists and it's designed to raise awareness of the importance of good orthodontic health. Throughout the month of October orthodontists, dentists and other healthcare providers will be stressing how important it is to have a healthy, straight smile. National Orthodontic Health Month also aims to recognize the dedicated work of the country's orthodontists and other dental professionals. Our Golden orthodontist, Dr. Shearer, along with the Canyon Point Crew will be observing National Orthodontic Health Month by stressing how important good orthodontic health is. We will also be reminding people of the importance of maintaining good oral hygiene. Practicing good oral hygiene is important for everyone, however, it's critical if you're wearing braces because food particles and plaque are more difficult to remove from around, under, and between the brackets & wires that make up your braces. It's probably no coincidence that National Orthodontic Health Month takes place when America is celebrating Halloween. This is when more candies and sweet treats are consumed than at any other time of the year. When you had your braces put on, we told you that you must avoid eating certain types of foods that can damage or break your braces like gooey, sticky, hard, and crunchy foods. So when you're celebrating Halloween this year, steer clear of those chewy candy bars, caramel & candy apples, jelly beans and any other treats that can damage your braces. Just remember to brush and floss your teeth after indulging to avoid getting cavities! We recommend taking a toothbrush and floss along with you when you'll be away from home for long periods of time so you can step into a bathroom to brush and floss your teeth after eating. Hoping you have a safe, fun, and happy Halloween! What is Opal Seal and How Does it Work? 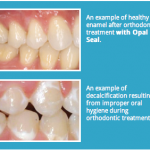 Just as the name implies, Opal Seal acts as a sealant or barrier between the enamel on your teeth and harmful plaque by completely covering the surface of your teeth. It provides your teeth with fluoride which is an essential mineral needed to preserve healthy tooth enamel. 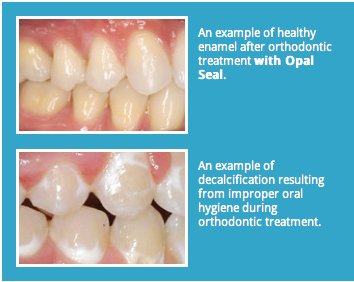 Opal Seal helps to counteract the buildup of plaque on your teeth to prevent decay while you're wearing braces. This sealant is applied in a thin layer to the surface of your teeth wherein it slowly releases fluoride to keep your tooth enamel healthy. At Canyon Point Orthodontics, we not only want your teeth looking and functioning great after you get your braces off, but we also want them to be healthy. Once you get your braces on, we'll instruct you how to properly brush and floss. We will also encourage you to maintain regular dental checkups and cleanings during your orthodontic treatment. But our Canyon Point Crew goes above and beyond that by offering to apply Opal Seal to your teeth before we put your braces on. Along with your good oral hygiene routine, Opal Seal will help prevent decalcification.When you're wearing braces, white areas can appear on your teeth around your brackets which is a sign of decalcification. And if these white spots are left untreated, it can easily lead to tooth decay. When Opal Seal is applied to your teeth before we put your braces on, it helps protect your teeth from decalcification, but good oral hygiene is the main key in preventing these white spots! This sealant is BPA-free and safe for every patient. Opal Seal lasts for months and can easily be reapplied as necessary. If you have any questions about Opal Seal, check out the video link below and please don't hesitate to contact us as we're always happy to speak with you! You CAN Floss With Braces?! Encouraging kids to floss is a challenge for most parents, but it becomes even more challenging when children have braces. 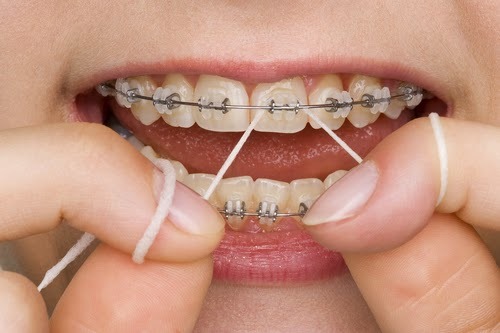 The wires in braces prevent you from flossing traditionally, and is difficult to do on your own. Orthodontic care is an important part of maintaining a healthy smile, but it takes commitment from patients and parents to make sure teeth stay healthy while they're being straightened. We understand using floss on teeth with braces can be difficult and frustrating, but it can be done and is an important part of proper oral hygiene. Sliding the floss between the teeth above the wire is a bit like threading a needle. An orthodontic floss threader is an inexpensive and disposable tool available in nearly any store that sells toothbrushes and toothpaste. It is indispensable when flossing teeth with braces because it allows you to pull the floss through the teeth above the wire and reach the gum line. Another helpful option is a pre-threaded flosser designed specifically for braces, like OrthoPick or Playtpus. Some younger children with braces lack the dexterity required to floss successfully. You most likely will need to help your child floss. It's best to have him or her kneel or sit in a well-lit area, as it can take a few minutes. If your child has a difficult time sitting still, have him or her sit where he/she can watch a favorite show or listen to music while you floss. While dental care is important for all kids, children with braces should be especially encouraged to take care of their teeth. Guardians and parents should play an active role in ensuring proper dental care. Flossing with braces is a little more challenging than flossing teeth without braces, but it must done regularly to prevent gingivitis and plaque buildup.